On March 20th, 2002, a group of ten professional researchers with backgrounds in the fields of art history, conservation science and bibliography for historical art technology met for a one day meeting at the Netherlands Institute for Cultural Heritage in Amsterdam. The meeting was convened by Christoph Krekel and Ad Stijnman and the participants discussed what they would term ‘art technological source research’. The term ‘sources’ then covered such various materials as technical treatises and books with recipes, imposts and artist’s inventories, studio interiors and depictions of tools, construction drawings of machines and plans of workshops, while the art objects themselves were seen as primary sources. Fig. 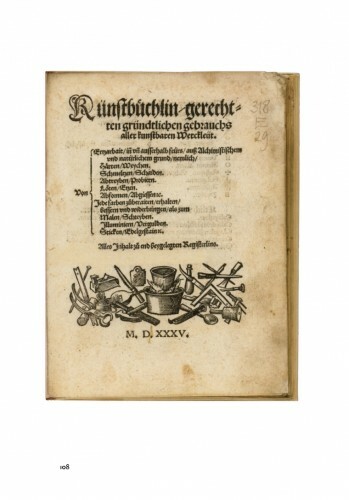 1: Kunstbüchlin, Frankfurt aM: Egenolff, 1535, Bibliotheek Rijkmuseum, Amsterdam. As a result, they founded the Art Technological Source Research (ATSR) working group, because the one thing the participants had in common was a close interest in and study of coeval documentation of the technology of any type of art or craft discipline through all times. It was then considered that – although most participants had a certain interest in the conservation of art objects – research of art technological sources could be linked to many other disciplines, for example: art history, the histories of economy, science and technique, and to the modern practices of artists and craftsmen. The working group’s main objective became ‘to be a platform for the exchange and dissemination of information on the subject of sources of art materials and techniques’. The definition of what these ‘sources’ could be – and consequently what ‘art technological source research’ should comprise – was defined rather in a general manner at the time, as it also included examination of objects and contextual art historical study. This approach caused some confusion about what ATSR stood for and often enough – although many abstracts were promising – resulted in presentations at ATSR meetings that showcased the results of successful art conservation projects that would have been better suited to conferences in the fields of Conservation, Conservation Science or Technical Art History. The actual research of ‘sources’ was then usually limited to a short reference to a historic text, sometimes an image, but often without critical apparatus (no consideration of the source’s deeper meaning and context, or evaluation of the validity of the published transcriptions or translations). The sixth ATSR symposium Sources on Art Technology: Back to Basics (Amsterdam 2014) therefore focused on the working group’s core business: the art technological sources themselves and their research, less so what could be done with the research results, as was a common theme in preceding symposia. These, on the other hand, had demonstrated that the profound disclosure of sources relates coeval information on art technology to the style and the material condition of art objects, which is important for all further study of such objects, in whatever field. Instead of an all-encompassing definition of the working group’s activities, it may be better to describe ‘art technological source research’ as: the close study of contemporaneous textual and visual documents which communicate information on art technology of the period under study. Understanding these documents requires variously: language skills, knowledge of palaeography and codicology, an art technological training, some background in science, an interest in art history, an eye for political, religious and social aspects, an understanding of historical weights and measures, etc. In some instances, understanding of sources is greatly enhanced by carrying out reconstructions, ranging from preparing basic recipes to re-enactments and historically accurate reconstructions. The need for Art Technological Source Research can be illustrated by the progress that has been made in the last decades in the understanding of technical terminology in historical texts. Due to the interdisciplinary perspective and focus that researchers have brought to this field, a growing amount of source material that had long been neglected can now be appreciated and understood, as its specialist vocabulary whose meaning had been lost over time, has been deciphered for modern readers. Without the backgrounds in science, craft, materials and the technology of contemporary objects that is typical of ATSR researchers, the historical terminology for art materials and processes remains opaque, ignored as it is by etymological dictionaries and art historical discussions due to its highly specialised nature. Without testing and reconstruction, the validity and meaning of many sources remained hidden; after recent researches, we can now better distinguish between the practical and the alchemical, the intellectual construct and the workshop note in many cases. Art Technological Source Research of visual sources is largely pending, however. Although initial progress is made with some dedicated projects researching historic studio interiors any standardisation of this kind of research and definition of visual elements is still in its infancy. Fig. 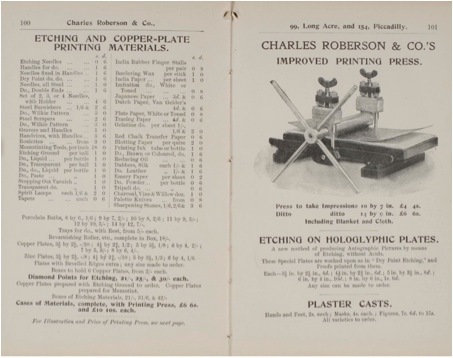 2: Catalogue of Charles Roberson & Co, London (c.1900), private collection. This leaves the question where Art Technological Source Research stands in relation to Art History, Conservation, Conservation Science, Technical Art History and a range of other historical disciplines, as well as modern art making practice. It can be a discipline of its own, but can also form a cornerstone of one of these disciplines, while otherwise one of these can be a cornerstone for ATSR. It will depend on the initial research question and the background of the researcher. While ATSR concentrates on textual and visual sources, the information obtained from it can be applied in yet larger ways, contextualising it to allow us to better understand the materiality of our artistic heritage. M. Clarke, J.H. Townsend and A. Stijnman (eds), Art of the Past: Sources and Reconstructions, London: Archetype Publications, 2005. S. Kroustallis, J.H. Townsend, E. Cenalmor Bruquetas, A. Stijnman and M. San Andrés Moya (eds), Art Technology: Sources and Methods, London: Archetype Publications, 2008. E. Hermens and J.H. Townsend (eds), Sources and Serendipity: Testimonies of Artists’ Practice, London: Archetype Publications, 2009. S. Eyb-Green, J.H. Townsend, M. Clarke, J. Nadolny and S. Kroustallis (eds), The Artist’s Process: Technology and Interpretation, London: Archetype Publications, 2012. H. Dubois, J.H. Townsend, J.Nadolny, S. Eyb-Green and S. Neven (eds), Making and Transforming Art: Technology and Interpretation, London: Archetype Publications, 2014. J. Bridgland (ed. ), Preprints of the ICOM-CC 15th Triennial Meeting, New Delhi: Allied Publishers, 2008, 3–24. This text represents my personal view on ATSR and its relation to other disciplines, but I want to acknowledge Jilleen Nadolny for her additional suggestions and discussions. 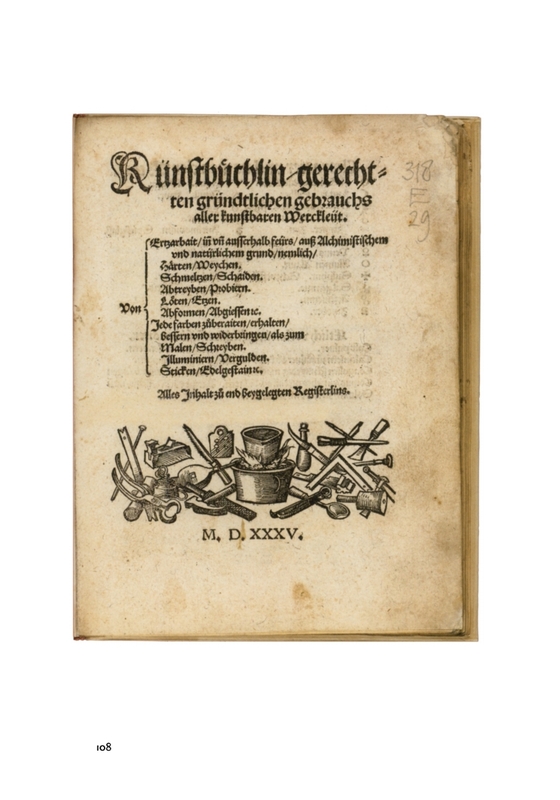 ‘Kunsttechnologisch bronnenonderzoek’ (Dutch), ‘Kunsttechnologische Quellenforschung’ (German). A. Stijnman, M. Clarke and J.H. Townsend, ‘Foreword’, in Art of the Past: Sources and Reconstructions, M. Clarke, J.H. Townsend and A. Stijnman (eds), London: Archetype Publications, 2005, v-vii. Today’s First Monday Library Chat will kick-off a series of blog posts featuring the Rijksmuseum, the museum of the Netherlands, located in Amsterdam. Within the main building is the Rijksmuseum Research Library, which holds the most extensive art history library in the Netherlands. Like the museum, the Library’s primary collecting focus is Dutch art and history from the Middle Ages onwards. Today I’m chatting with Geert-Jan Koot, Head of the Rijksmuseum Research Library, and Dr. Marjolijn Bol, University Lecturer for Conservation & Restoration and Art History at the University of Amsterdam and postdoctoral research fellow at the University of Hamburg. The Rijksmuseum has just undergone a significant restoration project. Can you tell us a bit more about this? How has it affected the Research Library? New spaces have been designed for the Rijksmuseum, and old spaces have been given a new meaning. It was recognized that the building had been neglected. The museum had been turned into a labyrinth. Every aid to orientation had been cut away or camouflaged. The library too, was completely hidden, and not accessible from the main building. Visitors had to go outside and use a separate entrance. The restoration of the library hall was part of the concept of the New Rijksmuseum. This means that the alterations that were made in the past were reversed and the original features, which were still largely discernible, properly restored. For the first time in history, the general public can now access this part of the museum. The use of the library will now be closest to the architect’s conception of the building being more accessible. 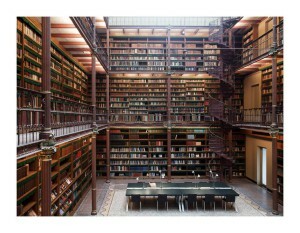 Could you talk about the relationship between the Rijksmuseum and the Rijksmuseum Research Library? It strikes me that Art History is a discipline where access to both museum and library collections would be equally important to and utilized by your patrons. According to the Rijksmuseum’s vision, the reading room in the library hall is intended for visitors who, inspired by what’s on offer in the museum, want to go into further detail on the history and art of the Netherlands and elsewhere. Museum visitors are welcome to look something up or linger to enjoy their visit a little longer. There is no doubt that it is a unique experience for visitors of the Rijksmuseum to get a look inside this magnificent space. Nowadays one might find more museum visitors in the library hall than scholars. However, compared to the time before the reading room in the library hall opened its doors, the number of scientific library users grew as well. In the attached study room the special collections can be examined: rare books, prints, drawings and photographs. Because of its lighting conditions and calmness, the study room is also ideally suited for scholarly research. In 2014, the Rijksmuseum launched an extensive fellowship program for pre-doctoral students to pursue dissertation research that shows a clear relation to the museum’s collections and expertise. The library will become the meeting place and the research center for the ten fellows we hope to welcome this and in following years. The aim of the library is to provide research resources and to facilitate research, thus strengthening international research on Dutch art. Your artists’ recipes are, of course, of great interest to readers of this blog. What recipe-related items do you have in your collection? Are they primarily in print or manuscript? The Rijksmuseum collection of art technological sources covers primary documentation concerning the practical aspects on the application and use of techniques, materials, tools and machines for the making of objects of art and culture from the middle ages until today. The extensive collection of artists’ manuals and drawing books is also of eminent importance. This collection lists over 950 printed and written art treatises, dating from 1525 to the present day. Most of them are printed, only a few are manuscripts. A list of these titles is available in our web catalogue. Many decades ago the museum started collecting these books and this collection is growing annually with a few dozen titles. New titles are publicized in our lists of acquisition highlights. 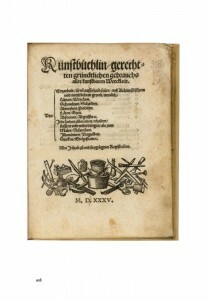 A fine example of a recently acquired early and rare German recipe book is the Künstbuechlin, gerechten gründtlichen gebrauchs aller kunstbaren Werckleüt (Augsburg, 1535). Why does the Rijksmuseum have this special collection of artists’ recipe books? Visitors to the museum and people interested in art and culture often like to know how objects were made and also from what materials they were made. To stimulate these questions, the Rijksmuseum performs research into the history of artistic materials and techniques. 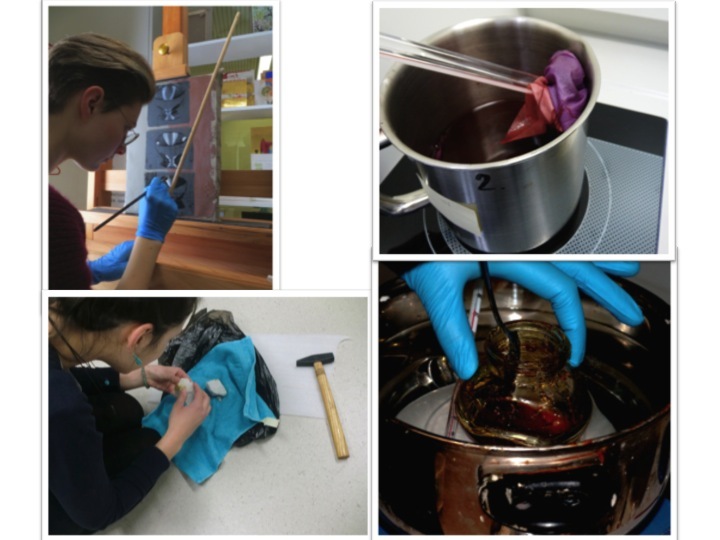 This research improves conservation methods and the restoration of the objects in the museum. The library contributes to these goals by bringing together a collection of international artists manuals and instruction books and recipes. How are these recipes helpful for learning about artists’ processes and materials? The study of art technology is increasingly recognized as an important source of information. This is not only to determine the material history of an art object and its conservation, but also to contribute to knowledge about the cultural aspects of the production of a work of art: aesthetic, economic, social, religious, etc. Our aim is to make the collection of recipe books in the library more widely and freely available. A project to digitize these practical treatises is about to be realized. 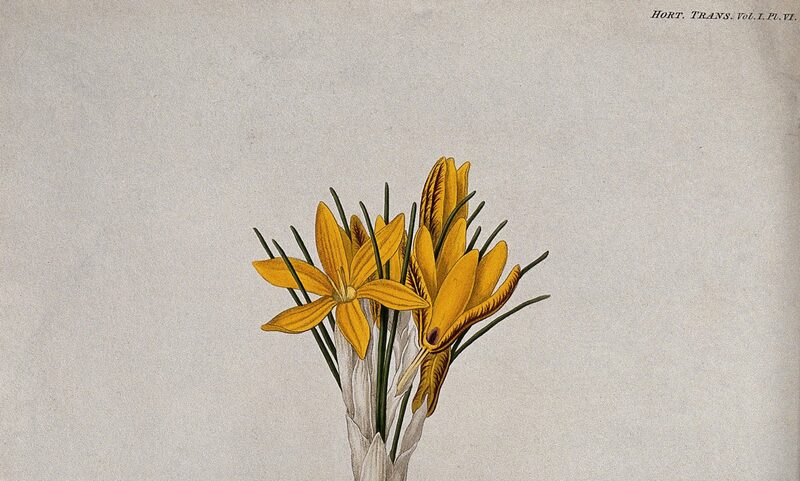 The proposal to connect the artist’s recipe book collection to the ColourContext database of the Max Planck Institute for the History of Science in Berlin has been well received. I understand Dr. Marjolijn Bol’s recent course Art Technological Source Research at the University of Amsterdam held some classes at the Rijksmuseum Research Library. Can you talk more about the pedagogical value of bringing student groups to a special collections library? What extra value does this offer? In an age in which more and more historical sources are made accessible online, it is of great value to be able to confront and familiarize students with original source material. This teaches them not only where to find the originals, but also why it is still very important to study them in situ. Thanks, Geert-Jan and Marjolijn, for chatting with me! 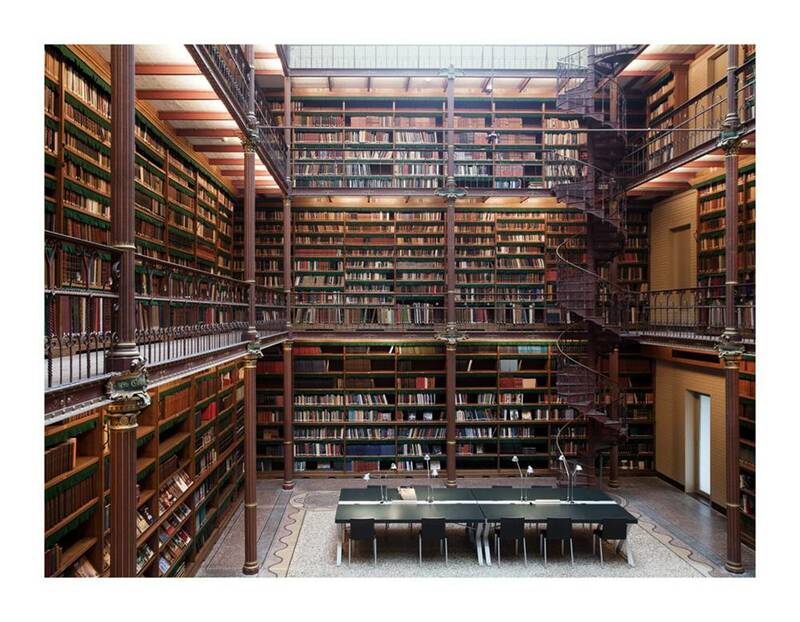 The Rijksmuseum Research Library’s reading room is open Monday – Saturday, 10am – 5pm. If you wish to view rare or fragile works, please email studiezaal@rijksmuseum.nl to make an appointment. Yesterday I read some press releases about a fascinating Welsh research project (based at my University: Cardiff University) that will screen Welsh honey for antibiotic properties. The aim is to find the Welsh answer to Manuka honey, by driving bees to flowers with the highest antibiotic properties. This project, if successful, will no doubt have significant positive medical, ecological, and economic implications. The press release mentions the use of medicinal honey since the Middle Ages. One should never take press releases too literally, but the history of employing honey medicinally goes much further than the Middle Ages. 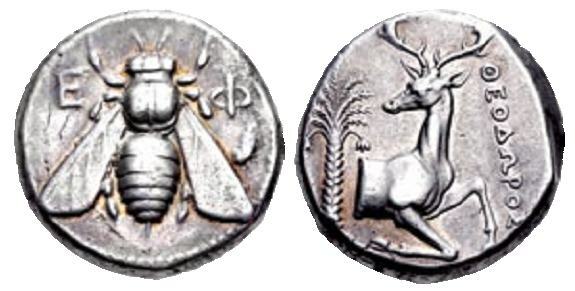 I will focus here on the Greek and Roman periods of antiquity, but honey was used in many cultures well before the Greeks started using writing. Several interesting things here: first, the Attic honey is not the only ‘ethnic’ ingredient in this recipe: it also contains Egyptian natron. This use of geographically-qualified ingredients is a characteristic of ancient recipes. Second, the author understands that not everyone will have access to Attic honey and suggests using the best possible honey available if that is the case. Third, the recipe recommends not to boil the honey together with the other ingredients, possibly indicating an awareness that heat destroys some of the qualities of honey. The Hippocratic authors do not tell us what made Attic honey special, but other medical authors tell us that Attic honey (and in particular the honey of Mount Hymettus) was special because the bees fed on thyme, which was itself an important medicinal herb. Some writers produced lists of plants that produced the sweetest honey (thyme, violets, asphodel, iris), and those that should be avoided (spurge, thapsia, wormwood, wild cucumber). According to Palladius, a fifth-century CE agronomist, these plants had to be avoided because their bitter taste would prevent the creation of sweetness (1.37). The Greeks and Romans also mention poisonous honeys. 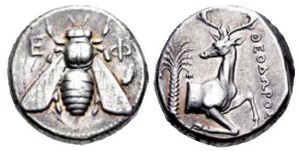 The historian Xenophon (fourth century BCE) describes the effect of a poisonous honey to be found in the land of the Colchians (East Coast of the Black Sea, modern Georgia). And swarms of bees were numerous there, and the soldiers who ate the honeycombs all went out of their mind, vomited and suffered from diarrhoea, and none of them was able to stand up; but those who had consumed only a little appeared like those who are extremely drunk; while those who had taken a lot seemed like mad or even dying men. Thus many lied there as if there had been a defeat, and there was much despondency. But the next day nobody had died, and around the same hour as they [had taken the honey], they came back to their senses. And on the third or fourth day they got up, as if after a poisoning (pharmakoposia). [Xenophon, Anabasis 4.8.20-21]. Unfortunately, Xenophon does not tell enough about the flora of the region to make a hypothesis about the nature of the plants upon which these bees fed. Pliny the Elder also describes a poisonous honey from Heracleia Pontica (on the Black Sea, modern Turkey), this time produced from a plant called ‘the goat killer’ (Natural History 21.74). I wonder whether modern apiculturists are aware of such poisonous honeys, and whether these dangerous honeys, taken in small doses, could be used medicinally? In any case, there is much scope for honey bioprospecting, and I wish my Cardiff colleague the best of luck!